Santa Rosa Beach, Florida – Erin Bakker and Ali Weil, Owners of The Hive Creative Consulting, are excited to announce a new business venture that will bring great value and opportunity to the South Walton culinary community! The Honeycomb Kitchen & Catering is a new local business that offers catering services and a shared commercial kitchen space that can be rented by other small, culinary businesses. “One of the things we love most about the work we do at the Hive is bringing the community together. What better way to continue doing that than by offering a much needed resource to other small business owners in the community” said Weil. 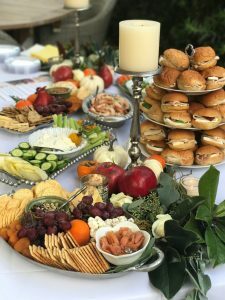 As The Hive, a local Marketing and Events Management Firm, planned client events, Weil and Bakker continually found themselves in need of customizable catering services to meet their clients’ needs and expectations. So, in true worker-bee fashion, they launched the Honeycomb Kitchen & Catering. When catering, The Honeycomb takes pride in their ability to evaluate the culinary needs of its clients and works to create a beautifully curated spread to surprise the crowd and wow their taste buds! “The Honeycomb allows the Hive to provide our clients with a total turn key event that exceeds their expectations. What sets us apart is that we incorporate a beautiful aesthetic into a catered experience,” said Bakker. The Honeycomb specializes in integrating their clients’ vision for culinary creation into a tailored and unique event. The Honeycomb Kitchen on the other hand, provides the tools and space necessary for local culinary professionals to create the products they offer to the community. When the Hive was working to find a space for their catering business to call home, they realized the lack of resources available in South Walton for small scale culinary professionals. The Honeycomb Kitchen will serve as a space where local makers can come to grow and enhance their businesses. “We want to create a community within the Honeycomb’s Kitchen. We want to see those using the space be successful in their business and want to help provide them the tools to do that,” said Weil. Weil and Bakker hope to expand the services the kitchen offers in the future and will work to hold culinary workshops, classes, and retreats in the space! Interested in leasing the commercial kitchen space to produce your tasty treats? Looking for an exceptional catering company to cater your next business or private event? Come see what the Honeycomb Kitchen & Catering has to offer at their Open House on January 26th from 10:00 – 11:30 am at 88 Lynn Drive. Lite breakfast bites and refreshments will be provided. 3 for 30a – Crabs, Yoga and Sunday Funday!